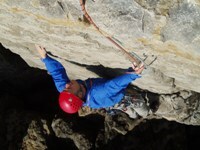 Information about rock climbing at Swanage and Portland is collected together in this part of the Dizzy Heights website. 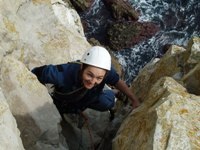 I hope that you will find something useful, and maybe get a bit more from your Dorset rock climbing adventures as a result. The information is by no means comprehensive, in fact it's a fairly incomplete	collection of route information, cafe beta etc. mixed in with anything that occurs to me that might be useful to someone else. Feel free to email me with anything from minor grade disagreements to long essays. I'll either add it to the site, or not, as takes my fancy at the time.